Many moons ago I lived in the suburb of Eastwood. I knew every single restaurant, cafe and grocery shop around Eastwood. At that time I would frequent my favourites and knew of the new venues opening up. That was then. Now I don't go to Eastwood much and this is mainly due to horrendous parking and burgeoning crowds that converge at Eastwood on the weekends. It can be quite off-putting and I tend to stay away unless I have to be there. Which is the reason I didn't even realise that Gia Hoi had opened a branch in Eastwood. And according to the web, it has been opened for about 2 years. Sigh! Now this is what I would term 'slow as'! So my checking out begins over 3 visits. Bun Chao Tom - Grilled minced prawns with rice vermicelli. The minced prawn cake were thinly sliced and served over a bed of rice vermicelli with a side of fresh bean sprouts, pickled carrots and shredded lettuce. The dish was served with nuoc cham. Yum! I have a weakness for this dish. Loved how fresh the vegetables were and the prawn cake was full of flavour. Bun Bo Hue Dac Biet - Special Pork and Beef with Rice a Vermicelli Soup which is hot and spiced based. I honestly cannot recall if I have ever tried this dish before but I have fallen in love with Bun Bo Hue. The broth which was a combination of pork and beef stock was deliciously rich, slightly oily, spicy and perfect to slurp up on a slightly chilly evening. The noodles had a lovely al dente texture and reminded me of the Italian spaghetti but Asian style. There were slices of beef, pork, pork sausages, pork knuckles and blood cakes. I couldn't bring myself to have any of the blood cakes, sorry I am not that adventurous but all the meats were delicious. I especially loved the pork sausages. There was also a side dish of shredded cabbage, bean sprouts, mint and lettuce, thrown into the mix. Com Bo Xao Sa Ot - Lemongrass beef with chilli served with rice. I asked for the tomato rice but this dish is typically served with plain boiled rice. When the dish arrived at the table I was busily checking out my twitter feed and as I quickly looked up the aroma of the just cooked beef filled my nostrils. It smelt wonderful and was definitely delicious. There was enough spice in it to make the dish interesting. Let me put it this way, it is definitely not a bland dish! I also decided to have something sweet on my 3rd visit and succumbed to one of my favourite sweet drinks Che Ba Mau (Three Colour Sweet). I am so happy to know that when I have a Vietnamese craving, there is a rather authentic restaurant near to where I live. By the way, the menu here is so extensive it can be quite overwhelming. Did you know there are up to 127 savoury dishes on offer here? So we can head here for our Vietnamese fix one day too. The huge menus in Vietnamese restaurants is always impressive. 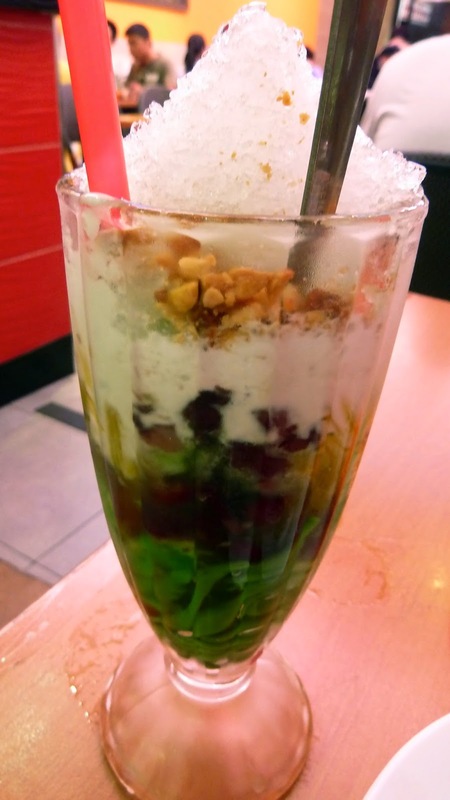 And I can never resist che ba mau - it's like a dessert and drink in one! Hi Helen, I am already thinking of what to eat next when I am there! Hehe! Hi Macky, thanks for visiting! Agree, love Vietnamese cuisine!